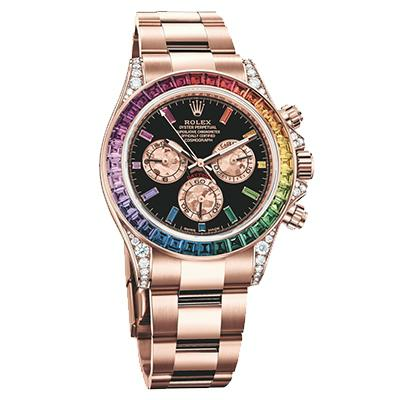 Rolex is introducing a scintillant gem-set version of the Oyster Perpetual Cosmograph Daytona. Created in 1963, this watch has established an extraordinary track record in the world of motor sport, rising to the rank of an icon. 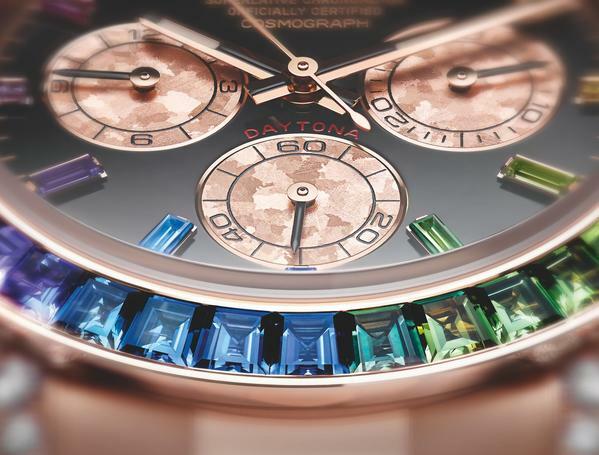 Like all Rolex watches, the new Cosmograph Daytona carries the Superlative Chronometer certification, which ensures excellent performance on the wrist. The Cosmograph Daytona’s Oyster case, guaranteed waterproof to a depth of 100 metres (330 feet), is a paragon of robustness and reliability. 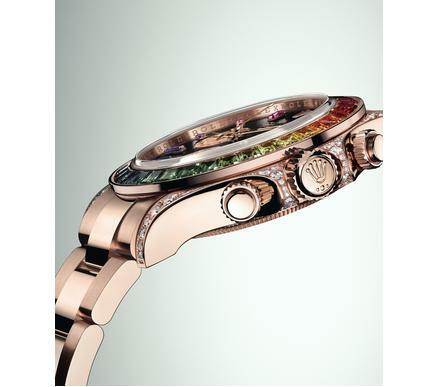 Its middle case, with an integral crown guard, is crafted from a solid block of 18 ct Everose gold. The case back, edged with fine fluting, is hermetically screwed down with a special tool that allows only Rolex watchmakers to access the movement. 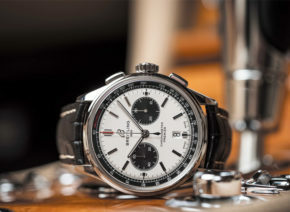 The winding crown, fitted with the Triplock triple waterproofness system, screws down securely against the case, along with the chronograph pushers. 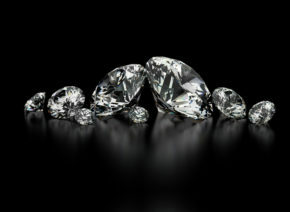 The crystal is made of virtually scratchproof sapphire. The waterproof Oyster case provides optimum protection for the Cosmograph Daytona’s high-precision movement. The Cosmograph Daytona is equipped with calibre 4130, a self-winding mechanical chronograph movement ent irely developed and manufactured by Rolex. A consummate demonstration of Rolex technology, the movement incorporates a chronograph function with a reduced number of components, thereby enhancing the movement’s reliability. 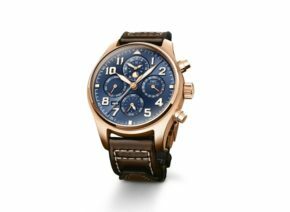 The robust chronograph is engaged by a mechanism with a column wheel and vertical clutch, providing an instant and extremely precise start. The oscillator, the true heart of the watch, has a blue Parachrom hairspring manufactured by Rolex in an exclusive paramagnetic alloy. Insensitive to magnetic fields, the Parachrom hairspring offers great stability in the face of temperature variations and remains up to 10 times more precise than a traditional hairspring in case of shocks. A Rolex overcoil ensures its regularity in any position. Calibre 4130 is equipped with a self-winding module via a Perpetual rotor and offers a power reserve of approximately 72 hours. This new version of the Cosmograph Daytona is fitted on a solid-link Oyster bracelet in 18 ct Everose gold with ceramic inserts and an Oysterlock safety clasp to prevent accidental opening. 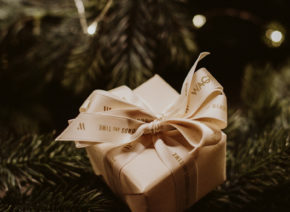 The bracelet includes the Easylink rapid extension system, patented by Rolex in 1996, that allows the wearer to easily increase the bracelet length by approximately 5 mm for additional comfort. Like all Rolex watches, the Cosmograph Daytona is covered by the Superlative Chronometer certification redefined by Rolex in 2015. 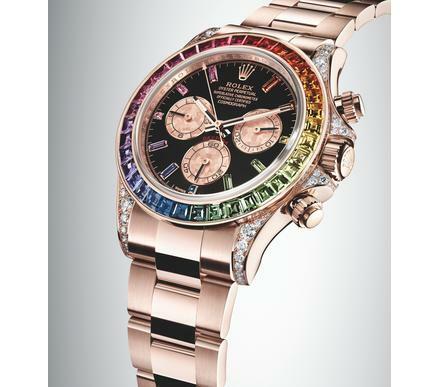 This exclusive designation testifies that each watch has successfully undergone a series of tests conducted by Rolex in its own laboratories according to its own criteria, which exceed watchmaking norms and standards. The certification applies to the fully assembled watch, after casing the movement, guaranteeing superlative performance on the wrist in terms of precision, power reserve, waterproofness and self-winding. The precision of a Rolex Superlative Chronometer after casing is of the order of −2 /+2 seconds per day, or more than twice that required of an official chronometer.